Last month we chatted with Sarah Kowitz of the Itasca Orchestra and Strings Program, one of our co-tenants at the Reif Center. There is yet another arts organization that calls the Reif Center home, and that’s the Grand Rapids Players (GRP). The Players just moved in since the renovation, but our relationship goes way back! One of the community members most associated with GRP is probably Sharon Marty. 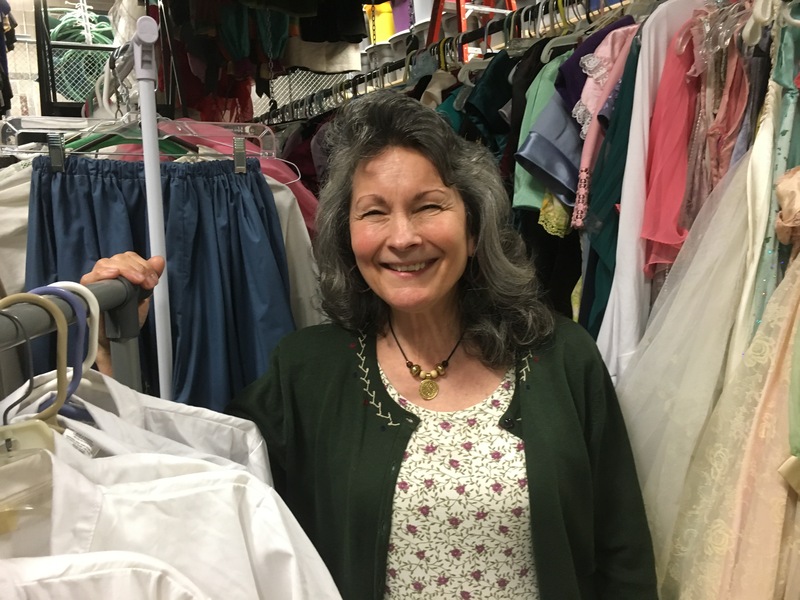 As Costumer for many of their productions, we see her at the Reif Center frequently (though she’s typically chained to her sewing machine, tucked away in the costume room). Her experience includes some great stories and a passionate connection to the arts in our community. We hope this interview gives you some insight into the organization she serves and the hard work that goes into a theatrical production! Katie: Are you a lifetime resident of Grand Rapids? Sharon: Essentially, my family is from here. My mom grew up here in Grand Rapids. My dad grew up in Calumet. Shortly after they were married and had my older sister, my dad being an electrical contractor, was in big demand when they were settling the city of Fairbanks, Alaska. When the news went out in this area, there was a whole bevy of people that went up there. After three years though we moved back here. So my brother and I were born in Fairbanks, but spent our whole lives here. Katie: How long have you been working with the Grand Rapids Players? Sharon: That’s a really good question! I think it’s been about thirty years. I’d have to look at the history to see when My Fair Lady was, but that was my first go-round with The Players. Roger Kjos, who was at that time President of the Reif Center, directed the show and asked me to work with him as costumer. Katie: But your involvement with The Grand Rapids Players goes beyond costuming their productions. How else have you served the organization? Sharon: Oh, lots of different things: I have had some on-stage roles; I’ve done costuming; I’ve been a board member and held all of the four officer positions; and I think I was pretty integral in the resurrection of The Players by developing a successful membership drive. A number of years ago now, I brought a proposal to the board that gave us permission to start a children’s theater summer program. Katie Smith, Sherry Harapat, and I worked together to build that. I’ve also collaborated with the Reif Center for some of their big productions doing costumes. Beyond that, I’ve worked to get us more exposure in the community, looking for opportunities to remind people that we’re here and we’re important. Katie: Who are The Grand Rapids Players? Sharon: The Grand Rapids Players are a community theater organization that was officially founded in 1965. We continually offer opportunities for all ages to explore the art of theatre both on-stage and backstage. In the last 10 years, we have really advanced our programming. It used to be fairly traditional to do two productions a year: a straight play in the fall, and then a big musical in the spring. But we’ve broadened our horizons and started doing dinner theaters, some readers’ theaters, we’ve featured original works, we’ve got our summer kids program, and now we’re collaborating with the Reif to develop theater education that will go through the school year. So, we’re moving on up! Katie: What impact has the Reif’s renovation had on The Players organization? Sharon: The renovation project has really been a God-send to The Players. One of the things that held us back from expanding our programming is that we are a non-profit organization with no steady stream of revenue. We would garnish profits from our fundraising campaigns and productions to pay the overhead of a big building – insurance, taxes, upkeep, heat, plowing, etc. And it was such a big facility that accessing all of our things was hard. Nothing was catalogued, boxes weren’t always labeled, so we often spent time and money on stuff we already had because we couldn’t find it or didn’t know we had (a problem that exists because the board changes over all the time). When we were invited to move into the Reif Center, we sold the building and committed a portion of the sale, $75,000, to the renovation. We didn’t have to give any of that money, but considered the move such a great opportunity that we made the commitment to support it. Now all of our things (costumes, props, etc.) are organized in a way that they can be accessed easily – almost like one stop shopping. Production materials and costumes don’t have to be hauled back and forth between the Playhouse and Reif Center for each show. We can tap into shared resources like phones and printing options. And, most importantly, we eliminated the overhead expense of our building which has freed up money to collaboration on a theater education program with the Reif Center. Hopefully that program will be profitable enough to collect seed-money for a future executive director, which would be hugely important for us. Being at the Reif Center also offers us opportunities to collaborate with local partners like the Reif Center, Reif Dance, and Itasca Orchestra because we’re all right here! We meet monthly to talk about what we’re each doing and to look for ways to work together. So, the renovation has really helped us and we hope that we can make the Reif Center proud that we’re here. Katie: You also have an office space or “store front” where the community can access the organization directly? Sharon: Yes. The Theater Education Director is using part of that, and if the dream comes true for an executive director to be hired in time, that’s what the office is for. Right now we have it set up so that if there is an emergency meeting or committee meeting there’s a place for us to gather. Katie: Going back to your role as a costumer, when did you learn to sew? Sharon: Well, that started when I was pretty young, maybe 13 or 14. I grew up in a family with a lot of kids and a pretty limited income, so I inherited my sister’s clothes all the time. Everything looked a little funny on me as she was twice as big around as me and shorter. I used to tell people that I invented the dropped waist because everything kind of hung on me like a sack. But, I went to parochial school and at the time it didn’t matter what I looked like. When it was time to go to the junior high, I felt a lot of pressure to dress like everyone else. One day I got real brave and thought, “If I can follow directions, I should be able to do this.” So, I went upstairs to Ben Franklin and bought some white cotton twill. I made a double-breasted pea jacket and corduroy bell bottoms and wore them on the first day of school. That was how it started. Katie: Costuming has a lot of complexity to it because you’re often recycling pieces or recreating garments. I imagine that takes confidence and imagination? Sharon: A lot, yea, and that was one of the barriers I faced when I first came into the world of costuming, because I was already an accomplished seamstress. I was making wedding dresses and ball gowns, competition attire, and I did a lot of tailoring and alterations. What I did had to be very precise. Then when I began costuming it was so different. I wanted all of my seams to be perfect and have everything match. You know, so that when people looked at it, they’d want to wear it. It took me a while to realize it just does not matter. Seams do not show up from the stage, and it’s smarter to not use matching thread because if you have to take it apart it’s a lot easier to see what you’re doing! And yea, to look at something and recreate it is pretty cool. 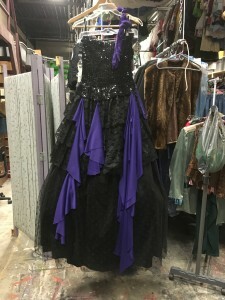 Like this dress here, (motioning to the costume she’s created for Ursula in the upcoming Little Mermaid, Jr.), it’s three dresses in one. Katie: Tell us about The Player’s costume collection. Sharon: It’s a huge collection that’s been years in the acquisition. There is a combination of things that have been made from scratch, vintage pieces that have been donated, military clothes, etc. We have costumes that go back to Biblical times from when we did Amahl and the Night Visitors, all the way through the centuries to modern day. We have quite a few costumes that were used in the very first shows The Players did fifty-some years ago. All kinds of things – suit jackets from every era, a collection of kid’s things, Roaring Twenties, an Asian collection. If you need it, we’ve probably got it! And that’s a bit of information we’d like to get out to the community. We would like to establish ourselves as a place where youth, civic, and other organizations can come for help. If we can open a door or enhance something you’re doing – that’s a dream! A good example is the middle school students doing living biography projects. We’ve gotten several phone calls from parents saying, have you got something for Amelia Earhart, or Thomas Jefferson, or Ben Franklin, or Betty Crocker, or whatever? There have also been churches in search of costumes for Christmas pageants. And we’ve helped all the area high schools for their theatrical productions. Katie: What’s your favorite thing from the collection? Sharon: When we did The King and I, and we had to make dresses for Anna, I watched the movie and I thought, “Oh my goodness, how big is that hoop skirt?” I knew they weren’t available that big, so I actually bought two hoop skirts, and sewed them together to create one enormous hoop skirt. Her dresses would take like seven yards of fabric. They were so big that we literally had them hanging backstage, and when it was time for her to get dressed she would just stand underneath the dress with her arms up and the dress would be lowered onto her. It was huge! They were fun to make but the fabric was everywhere! To have seven yards of fabric sitting on your sewing table so you could gather it into a 26” waist was a challenge. And then, to do all the costuming from that Thailand area, I had to study for a long time. To figure out how they made those fancy trousers for the gentlemen, I watched the movie over and over and over. I was looking for a line that I could track and finally there was one scene where Yul Brenner had on a pair of those bottoms and I saw a trim. I traced that trim around and up, and I thought “how did they do that?” Then it dawned on me: back then all fabric came off a loom. It was just a big rectangle that went into a skirt. If you grabbed that skirt from the middle and pulled up between your legs and tucked it into your waistband, you had a pair of trousers. That was a pretty cool discovery. Katie: In the 30 years you’ve been doing this, what would you say has been your crowning achievement as a costumer? Sharon: There have been quite a few of them. Oliver is one – to create those street urchins was really quite a feat. I had never distressed clothing before so, to get it dirty enough, I hung it out my car door and drove it around. People thought I was nuts! The King and I was a huge accomplishment. Chicago was over the top – to recreate the Roaring Twenties. The Sound of Music was huge. Any time we do a Broadway musical the costuming is immense. Katie: How much time to you put into costuming a Broadway-style production? Sharon: I think upwards of 500 hours from start to finish. When I create the costuming, first I have to read the script and start writing things down. Sometimes the costume is integral to the character and so I take a lot of notes. Then you have to meet with the director and say, “Here’s what I’m thinking. What are you thinking?” Then you meet the actors and get them sized up. Afterwards you come here and see what you have that might work. Then the sewing begins and it’s just hours upon hours. Katie: Do you ever work with a crew? Sharon: I’ve had people in the past that sign-on and it’s always good to have a team. But, the number of people that love to sew is getting less and less, and the number of people that are available is getting less and less too. So many people work long hours and only have one or two hours in the evening to sew. We just don’t have that much time. I sew like a bandit, and it’s sometimes easier for me to just do it, especially when there isn’t a pattern to work from. A lot of people that love to sew will say, “Just give me a pattern and I’ll make it for you.” But I oftentimes don’t have a pattern. I remember times, and only in the last 10-12 years because I was at Forest Lake School at the time, when I was working on a production that was running behind schedule. I would go home on my twenty-five-minute lunch break thinking, “twenty minutes is twenty minutes” (I lived only a block away). I would fly through the door, sew for twenty, and drive back to school. Katie: You recently retired from teaching Kindergarten at Forest Lake Elementary, but another way in which we’ve seen your face here at the Reif Center was when you attended daytime performances with your students. Tell us about your commitment to that program, because you were here more than any teacher. Sharon: I was. I would bring my class here probably six times a year. And, it didn’t have to be an educational performance that they were going to learn something from, but if it was a show that would be enjoyable and/or inspiring, we came. Sometimes it was a literary work and other times it was just a novelty of some sort, but I just really wanted my kids to be exposed to as much of the performing arts as possible. I would bring them to musical performances, dance performances, whenever there was an opportunity for an artist to come to our classroom, I was like, “Yes! How soon can you get here?” I just feel like being exposed to the world of performing arts is another thing that makes kids individuals. It inspires them to think, it inspires them to react, to try something on for size. In the world of making people, which is what teachers do, we help children find out who they are. And it was so fun to watch them and see their faces light up. To see them sitting on the edge of their chair and be so totally engaged with what was going on. It was so worth it. It was as important as anything else we did in the classroom. Katie: We also see you frequently here in the evening for performances because you’re married to David. What kind of performances do you love to see? Katie: So not the Ibsen plays? Camelot was wild and mesmerizing. Company B and Big Band music is great. The Rock and Roll Christmas Show is full of personality. Probably my top show though has been The Christmas Carol by Nebraska Theatre Caravan. The moment that curtain opened up it was like a Norman Rockwell print come to life. That was really, really spectacular! If you’d like to learn more about The Grand Rapids Players organization, you can do so online at www.grplayers.com.